This low loader is tailor made for groundwork machinery or small plant and equipment. By design, it is practical and strong yet easy to tow, which, for this type of work, makes it indispensable. 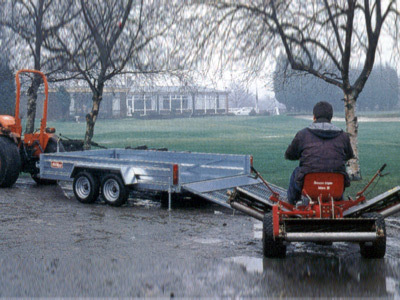 With a loading height of just 14”, the trailer is ever so easy to load. Whilst the wide stable track and standard features, such as a non slip floor, flush fitting deck rings and chassis mounted rope hooks, make transporting this type of equipment a very safe proposition indeed. 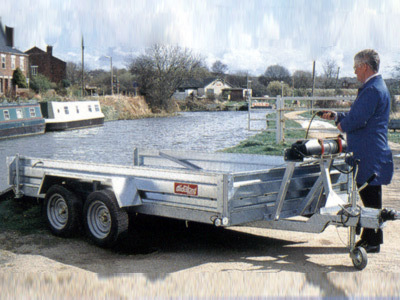 To achieve such a practical loading height, Conway use horizontal independent rubber torsion suspension beams, and position the wheels on the outside of the trailer body. The full width tailgate ramp is a mesh design to create less wind resistance, and improves both safety and towing vehicle fuel economy. 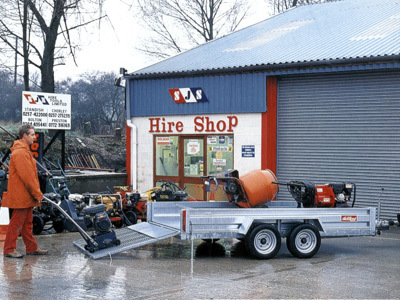 These immensely practical trailers are available in either single or twin axle versions, designed to support and withstand the rigours of regular loading and unloading. Easy to tow by a wide range of vehicles. Welded, hot dipped galvanised steel chassis for durability. Independent rubber torsion beam axle suspension. Designed for towing and loading stability. Wide stable track, wheels outside trailer body. Strong but lightweight construction, built to last, yet easy to repair. Sides can be painted to match corporate colours. Wide range of accessories to customise trailer. Meets D.o.T. and EC regulations. Nationwide dealer network for aftersales support.